If you're in the dark, don't worry. You're not alone. For all the attention your turkey gets on Thanksgiving, you have to assume he may get a little self conscious. Sitting up there, featherless and exposed on the table, he's bound to want to, er, cover up. Thankfully he has turkey booties for when he's feeling a little modest. 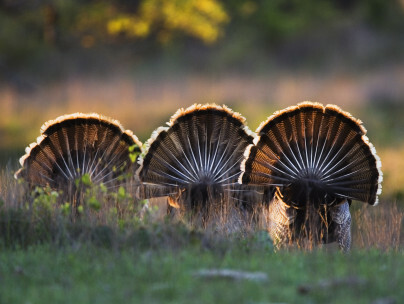 If you're wondering what the hell turkey booties are, don't worry: you're not alone. Allow us to explain. Turkey booties are not turkey butts. Turkey booties, also known as turkey frills, are little paper caps that people stick on the end of turkey legs, to cover up the unsightly ends of the bones. They're shaped sort of like miniature chefs' hats, and might be frilled or rounded at the top. They don't serve any other purpose than an aesthetic one, but that never stopped a trend from enduring. As far as we can tell, turkey booties have been around a long time and show no sign of fading into oblivion. If you're a devoted turkey bootie fan, you probably already have your go-to source or know how to make your own. For the uninitiated, here's a quick tutorial on how to make your own turkey booties this Thanksgiving. Fold a long strip of paper in half, lengthwise, leaving a small strip at the bottom. Cut small slits along the strip, but be careful not to cut through the tab at the bottom, so that the paper stays connected. Fold the paper back over itself in the opposite direction, and fold over the bottom tab. Roll the whole strip around your finger to fit it to about the size of your turkey leg. Then cut the strip to make it the right size, connect it with tape and fluff out the frills a bit, to make them look pretty. Place the booties on your bird after it's cooked. You don't want to make it even harder for your turkey to get around, after all.